You’re pregnant and trying to decide what you want to do when it comes to childbirth. You may have thought about having a natural childbirth but are afraid that you won’t be able to handle it. There are so many benefits to natural childbirth for both mom and baby, and lots of different approaches to laboring without medication. 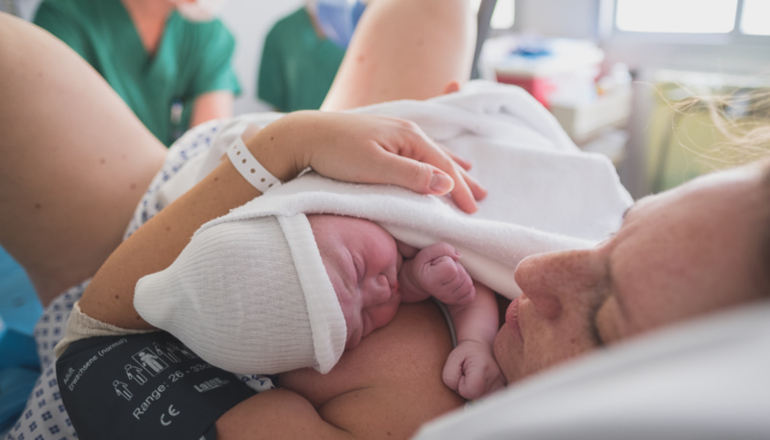 If natural childbirth is something you’ve been considering but haven’t made up your mind on, here are ten good reasons to give it a try. It’s better for baby: One good reason to try natural childbirth is so that your baby can avoid having unnecessary and potentially dangerous medications pass through her system. By avoiding pain medications your baby will be born more alert and more active than babies that have been drugged up from pain medications. More freedom during labor: When you labor with an epidural you are confined to the bed and will not have the advantage of being able to walk around during labor. You may not be able to move your lower half at all or sense the need to change positions when it would be beneficial. To avoid a c-section or other interventions: There are things that can lead to the necessity of a c-section, some are unavoidable, but others may be preventable. When labor is allowed to progress on its own, in its own time-frame, and the woman is allowed to respond naturally to the pain she is in, labor tends to go smoother and need less intervention. Additionally, women who labor flat on their backs, are induced earlier than when their bodies are ready, or who are not assertive and in control of their labor, may be more likely to end up having a c-section. To have the experience of labor: The labor experience is not just about experiencing pain, it’s about knowing what labor feels like, and knowing what you are capable of. It’s about gaining confidence from learning to manage your pain naturally, and experiencing the exhilaration that comes from pushing your baby out with the pain of a contraction. Less risks for mom and baby: Even though serious complications from epidurals are extremely rare, they can happen. Likewise, using other pain medications during labor also comes with risks. Pain medications can lower your blood pressure as well as your baby’s, can cause respiratory depression for both mom and baby, can slow down your labor, and can make you feel nauseous or dizzy. To have a shorter labor: When you use an epidural or pain medications, you may not be able to feel contractions or pain. Because of this, you may lose your natural instincts on what to do to help labor progress. Walking, rocking, or changing positions can help baby to descend and speed up labor. Breastfeeding is easier: Babies who are not exposed to pain medications are more alert after birth and this may help them to be more coordinated when it comes to breastfeeding. Because mom is not groggy or drugged up, she may have an easier time as well. Faster recovery: After giving birth with an epidural, it takes time for the medication to wear off and for you to be able to get up and move around. Some women also experience what is known as a spinal headache after having an epidural. When a woman delivers naturally she may feel better almost instantly after delivering and she can get up and move around shortly after delivering, or whenever she is ready. To have a more satisfying birth experience: Most women are thrilled to see their new babies, no matter how their birth took place. However, women who have a natural childbirth, often report feeling more satisfied and happy with their birth experience. Why not try? Most new moms wonder how bad the pain is and whether or not they will be able to handle it. There really is no way for you to know how your labor will be, how much pain you will have, or whether or not you can handle it until you actually try it. Even if you’re an experienced mom and have been through labor before, every labor is different. Why not give natural childbirth a try and see how it goes? How to Prevent Tearing During Childbirth?